[Editor's Note: For more than ten years, Substance he been following the stories about how Michael Milkie, founder of the "Noble Network of Charter Schools," has been forcing his "failing" students to return to the city's real public schools based on rules which no decent public school -- or teacher -- would impose on children. On January 22, 2014, Katie Osgood exposed part of this bullying campaign in remarks before the Board meeting. The Board voted to add two more "Noble" campuses to Chicago's schools at the end of its meeting. 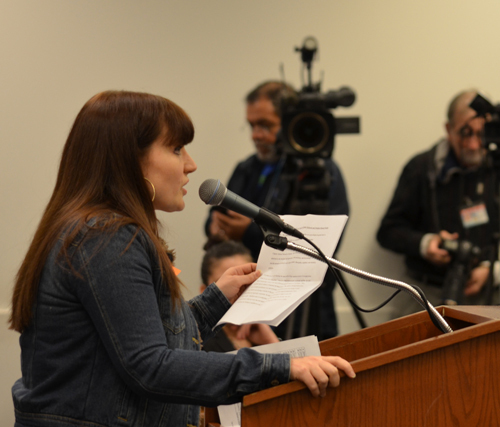 Teachers Katie Osgood was one of several witnesses who have been exposing the psychological abuse of students at the "Noble Network of Charter Schools." 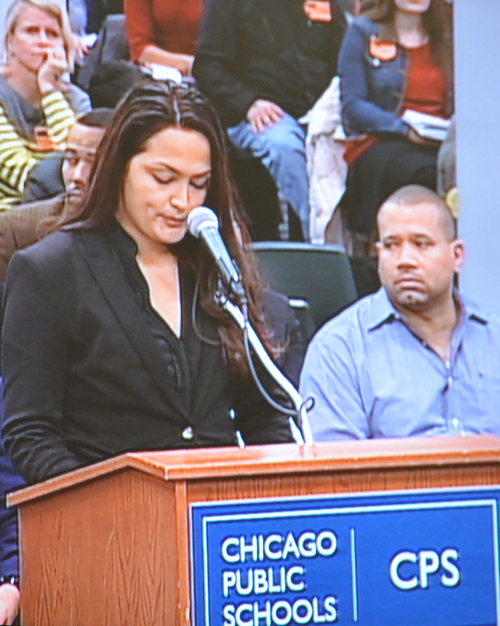 Above, Osgood is shown speaking during the January 22, 2014 meeting of the Chicago Board of Education. Substance photo by George N. Schmidt.Earlier in the meeting, a student from Steinmetz High School had told the Board that a fellow student had left Noble charter schools because of the pressures and that the 'race to the top' version of reality promoted by the Noble Street schools divided children from one another, while in the real public school it was possible to act like "family." George N. Schmidt, editor]. Hello. My name is Katie Osgood and I am a teacher at a psychiatric hospital here in Chicago. I am here today as a concerned citizen and an educator. In my hospital, we are seeing a disturbing pattern among patients coming from the Noble St Charter School Network of schools. We�ve seen an alarming number of students being admitted to the hospital with depression, severe anxiety, and increasingly with actual suicide attempts all directly tied to these schools� discipline, academic, and retention policies. 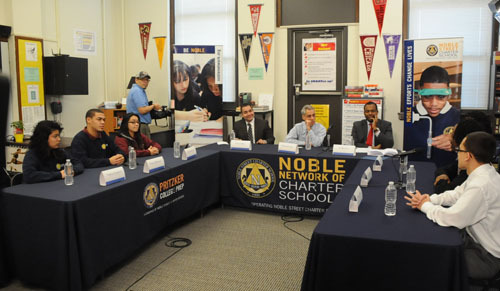 Local, state and national officials have been promoting the Noble Network of Charter Schools for more than a decade, and under the national administrations of George W. Bush and Barack Obama. Chicago Mayor Rahm Emanuel has been both a propagandist and a a protector of the Noble Street charters since his 2011 election. Above, Emanuel staged a propaganda event at the "Pritzker Campus" of the Noble charter schools in December 2011 for TV and other media. The mayor even had street crews cleaning the streets for three blocks around the event prior to the arrival of the cameras. Emanuel's rabid support for the charter privatization movement (he claims that Noble charters have the "secret sauce" for school reform) has allowed the continuation and expansion of the kinds of psychological abuse outlines by a growing number of parents and former students. The mayor's promotion of the schools has led a growing number of those who know the actual facts to compare Rahm Emanuel's cover ups for Noble Street with the Catholic archbishops cover ups of the more serious abuses by priests. Substance photo by George N. Schmidt.Over and over, we are hearing the same stories from students-stories of constant stress from overly strict discipline, exhaustion from unreasonable workloads, and the very real fear of repeating a school year regardless of academic progress or IEP status. These students report cultures of shaming and humiliation. They speak of feeling beaten down from constant punishment over the most minor infractions such as not coming to school with a belt or not looking a teacher in the eyes. Kids who struggle academically or have disabilities are especially vulnerable, but these schools refuse to change to meet their unique needs. Students come to us hopeless, in despair, because they feel they have NO CHOICE but to wake up every day and endure more long hours of the severity of Noble St. And some are turning to suicide as a way out. Angelica Alfaro, above, has been helping build the "Noble" narrative for more than five years, since she became a paid employee of the charter school. The narrative, which is repeated over and over, is a form of the salvation stories so popular in mythology, but leaves out the psychological brutality that has been part of "Being Noble" from the year of the school's founding by former Wells High School math teacher Michael Milkie. Substance photo by George N. Schmidt.When I speak to the school social workers, they admit that, especially among freshman, they see high rates of depression and anxiety. These schools know they are causing these dangerous mental health disorders. Noble St gets attention for their higher test scores, but their �secret sauce� has a dark underbelly of push-out, shaming, and abuse. As struggling students and students with disabilities are shed, scores may go up, but countless young people are being damaged as a result. And far too many are ending up in a psych ward. I wish to speak to all the current Noble St students. I want you to know that you are not alone if you are experiencing these feelings of extreme sadness, stress, or fear. And to the Board�I ask for a full, independent investigation of the Noble St Charter School discipline and retention policies. There are too many kids suffering in these schools to allow this system to continue unaccountable. When kids would rather hurt themselves than go to a school, then there is serious a problem. Do not vote for new Noble St campuses today. You will be responsible for more damage to Chicago�s young people. Vote �no� to Noble St.